1913 Bath House Inventory, p. 44, no. 238, in the Red Room, in the showcase to the left of the fireplace. 1914 Wernher Inventory, p. 44, no. 222. M. Bobinger, Kunstuhrmacher in Alt-Augsburg, Augsburg, 1969. E. Zinner, Deutsche und niederländische astronomische Instrumente des 11.-18. Jahrhunderts, 2nd edn., Munich, 1979, pp. 503-20. At each side of the rectangular instrument are sliding plates that, when withdrawn, reveal six varied dials. One of these plates is decorated with a circular inset disc of silver, decorated with a multi-coloured enamelled floral motif including a bird. The remaining area has an etched strapwork pattern. The gilded underside is plain. By removing this plate a hinged horizontal dial is revealed, with a folding gnomon. A notch at one side allows an arc to pass through it for setting the latitude of use. The arc has a threaded screw at one end to fit in a hole in a bracket on the inside of the case of the instrument. The arc is divided in single degrees from 30° to 54° on both sides. On the face of the dial plate is an outer band inscribed 'HOROLOGIVM * SOLIS', and divided in hours from 4 to 8 (morning to evening). The following band is divided into twice 12 hours. Next is a lunar volvelle with an aspectarium. The edge is divided into twice 12 hours, with an index at one 12 hour position that reads on a scale below the volvelle that is divided into 29½ days to give the age of the Moon. At the centre is a conjunction diagram for trine, quartile and sextile. The reverse of this dial plate has a table of sixteen rows and thirteen columns giving the Governors of the Hours. The column to the left is inscribed at the top 'HORE HICK DIES', and at the bottom 'HORE HICK DIES', the intermediary rows labelled with the names of the days of the week repeated twice 'SON TAG, MON TAG, ERICH TAG, MIT WOCH, PFINS TAG, FREI TAG, SAMBS TAG'. The twelve hours of the day and of the night head and end the rest of the columns, which are completed with the planetary sigils in a repeated sequence of seven. Reversing the instrument, there is another removable sliding plate with on the top a volvelle with cut-out arcs to give the length of the day or night throughout the year at three latitudes. Inscribed on the plate, below the volvelle, are the names of the months in Latin, and the days in each month, in two-day intervals, numbered to 30, 31 or 28 as appropriate. An index on the edge of the volvelle points to the day of use, while the rest of this band is inscribed [for Z read R] 'OMNIBVS IN REBVS MODVS EST PVLCHERZIMA VIZTVS [In all things the way is to contemplate the most beautiful]'. There follow three bands, the first inscribed 'QVANTITATIS NOCTIS' (aperture with pointer) 'QVANTITATIS DIEI' (aperture with pointer) 'AD ELIVATIO 50 GRAD'. Similarly for latitudes of 40° and 46°. The innermost band carries the signature and date; the central area is engraved with an arabesque pattern. The underside of the plate is plain. Removing the sliding plate allows another plate to be lifted out. On one side is inscribed the projection known as the organum Ptolemei, covering the Solar declination of 47°. The Sun's passage through the year is marked by the sigils of the Zodiac, and the time of day from 12 to 12. In a semicircle above is the latitude of use: 'ELIVATION * POLI * 48 GRAD'; followed by a quadrant 0-90° in two degree intervals, labelled in tens. 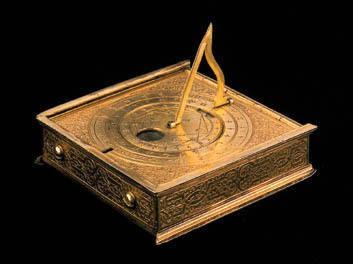 At the centre is a small rectangular hole that would have positioned the alidade (missing) for measuring the altitude of the Sun, the time then being found from the grid (see Bobinger, op. cit., p. 53). On the other side is a solar azimuth scale. One half has the hours of the day from 4 a.m. to 8 p.m., the other half a quadrant marked out every 15° (an hour) and divided into the Zodiac. With a gnomon at the centre, the first appearance (or disappearance) of the gnomon's shadow gives the place of the Sun in the Zodiac as well as the time of day. With this plate removed, one can bring into use a hinged plate marked out as a polar dial. The face is divided into hours from 4 a.m. to 8 p.m., and the Solar declination, the seasons indicated by the sigils of the Zodiac. The plate is set to the latitude of use by screwing in place an arc that runs through a slot at the side of the face. The arc is divided on one side 0-90° in intervals of 2°, labelled in tens; the other side is engraved with strapwork. A threaded hole at the centre is for a pin gnomon (missing). The underside is designed as a vertical dial, held in place at 90° by the arc to the side. At the top centre is a Sun's face in glory, the sides and bottom are marked with the hours from 6 a.m. to 6 p.m., the seasons denoted by the sigils of the Zodiac. A string gnomon (missing) is attached at the position of the Sun's mouth to the horizontal dial below; the gnomon served for both dials as in the conventional diptych dials. The plate forming the horizontal dial is fixed in position. At its centre is a magnetic compass, its case on an axis that allows it to remain level; the underside of the case is engraved with arabesques. The magnetic needle appears to be original, and this is probably true for the glass cover. The dial is marked out in half hours, labelled 4 a.m. to 8 p.m. Vacant regions are decorated with stippled arabesques. The four sides of the compendium are decorated with strapwork. Such patterns are produced in wax, followed by etching. As is customary with the work of Schissler, all the letters and numbers are punched. Zinner does not record a compendium of this type before 1554. Only three instruments were made earlier. Christoph Schissler (c. 1531-1609) was a renowned precision instrument maker of Augsburg, who produced a large copper globe with clockwork for Tycho Brahe. The workshop had an immense production, specialising in sundials, astronomical compendia, gunners' compendia and armillary spheres. An instrument case at the Museum of the History of Science, Oxford, contains an astrolable, quadrant, sundial, calculating tables, weather vane and a map of central Europe. Hans Christoph Schissler joined his father's workshop in 1580, and the two men distinguished their work by adding after their name: Senior, or Junior. In 1591, Hans moved to Prague.